Is This the First In-Space Portrait? One day while searching around for cool space photos, as we do, we stumbled across this Bloomsbury Auction offering up nearly 300 vintage NASA photographs. They come from the collection of Victor Martin-Malburet, a savvy young French space buff who discovered the niche a few years ago and began snapping up 1960s-era prints, soon amassing one of the biggest collections outside of NASA. He eventually combined forces with fellow Frenchman Felix Winckler, and the two displayed their Mercury, Gemini and Apollo collection in Paris and Tokyo before cashing out in this month’s London auction. 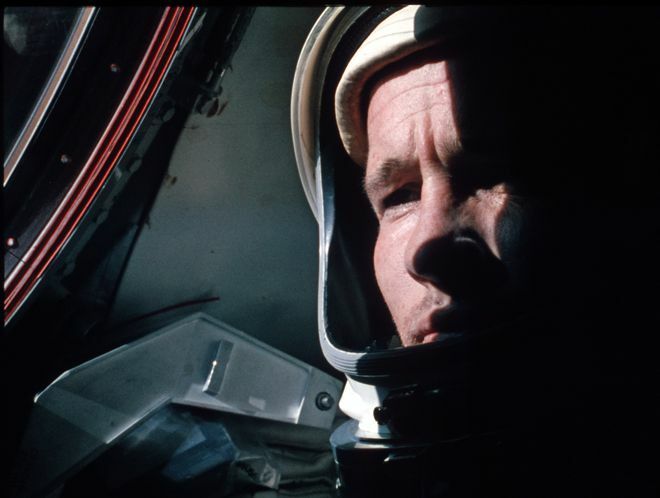 While browsing, we were particularly interested in this photograph, captioned, “Ed White in the capsule, the first in-flight portrait of an astronaut, Gemini 4, June 1965.” We wondered, was it really? We know about these 1962 photos of John Glenn taken while he was completing the first American orbit aboard Friendship 7, but we’ll assume “in-flight portrait” specifically means a photo of one human taken by another, and Glenn, of course, was the only person aboard. Gemini III had the first American two-man crew, but an improper lens setting on their camera left history with almost no in-space photographic evidence. There are also these images of cosmonaut Alexei Leonov taken by crewmate Pavel Belyayev during the world’s first spacewalk a few months before Gemini IV, but they’re actually stills from a videocamera (also, the auctioned photo’s caption says “astronaut,” so between that and not having access to all of Russia’s photograph archive, we’ll just stick with the Americans here). So might this photo of Ed White really be the first astronaut portrait photograph taken by another in space? We dropped a line to Mike Gentry, a researcher at NASA’s Johnson Space Center photo archives and asked him what he thought. Part of the problem is knowing whether or not this photo was taken before or after White’s spacewalk, which was thoroughly photographed by crewmate Jim McDivitt. So we took a look at the few frames surrounding the auctioned photo, which was labeled with the negative number S65-30549 (49). The previous negative, 48, is another, virtually identical photo of White inside the spacecraft, while the negative following the auctioned frame, 50, was taken during White’s spacewalk. We were about to feel confident that the in-spacecraft photo was taken before the spacewalk, until we kept going back. Frame 47? Nearly identical to 50. Gentry says it appears that this short series of negatives may be stereo pairs. Ed White exits the hatch on the first U.S. spacewalk. Courtesy NASA. So if the order of the negatives isn’t going to tell us anything, where else might we look? Some Googling took us to this exchange on CollectSpace.com, which refers to the mission transcript. On page 123, well after the spacewalk, White says to Mission Control, “You might ask … if they can work up some settings for inside-the-spacecraft pictures; we have 200 feet of film. I have taken a few in here already, but I thought they might give us a suggested light meter reading.” While certainly not conclusive, we might be able to infer from this exchange that McDivitt hadn’t taken any inside-the-spacecraft pictures yet, and therefore the close-up portrait of White was taken after the spacewalk. That would mean that McDivitt’s photographs of White during his EVA would truly be the first images of an astronaut taken by another astronaut. The photograph above at left (negative number S65-29730) of White floating out the hatch may indeed be the first. McDivitt: We’ve got a lot of other kinds of film we better take. White: The only thing, we’re not keeping good books on it right now. McDivitt: You’re telling me! It’s lousy! White: You keep books and then you miss other things. I suppose we can’t blame them for not wanting to “miss things” during their short time aloft, leaving us a mystery box of pictures. Our deduction is all a bit circumstantial, but we hope the buyer who laid down a cool 1400 pounds — a thousand pounds over the auction’s estimated value — for the vintage chromogenic print on November 3 was paying for the vintage-iness and the fact that it’s a gorgeous photo in its own right, and not necessarily its “first” status. Of course, since NASA’s photograph collection is not copyrighted, you can download the photo for free and print it out: 1400 pounds worth, except you’ll have to live with that new-print smell.